The complete course is four weeks, from April 1 - 26, 2019. Survey the business officer's areas of responsibility (either direct or indirect) from an enterprise perspective. Understand how your school's mission is implemented and how it translates financially, which are fundamental keys to institutional success. Explore the characteristics and behaviors that lead to greater mission alignment and financial sustainability. An independent school's biggest assets are its faculty members and the buildings they occupy. These also represent the major proportion of expenses. Creating a culture where employees feel valued and honored for the work they do, and providing and maintaining an inviting space in which students can learn is the business officer's responsibility. Learn how those costs relate to overall school finances. The partnerships between the business office and admissions and the business office and the development office are core to the school fulfilling its mission. Understand how these two departments interface with your families and your office to promote the school's overall financial health. 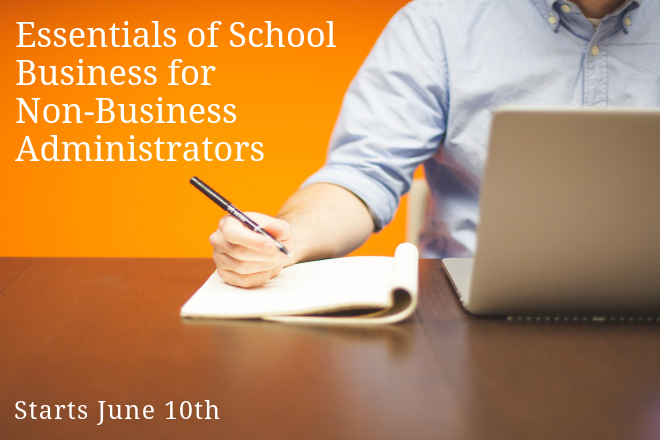 The independent school business officer community is one of great collegiality and resourcefulness. This week will survey a number of additional business officer responsibilities and describe the resources, from NBOA and others, that can help you fulfill them. NBOA is a recognized provider of recertification credits. HR Certification Institute® pre-approved this program for 12 HR Business credits towards aPHR™, PHR®, PHRca®, SPHR®, GPHR®, PHRi™ and SPHRi™ recertification.